About Good Grief, Charlie Brown! Good Grief! is a celebration of Peanuts, the world’s most influential comic strip and its cultural legacy. 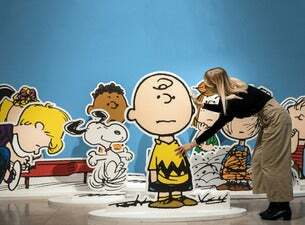 The exhibition has been developed in association with the Charles M. Schulz Museum and Research Center, Santa Rosa, California, U.S.A and features over 100 comic strips and artefacts from the Museum’s holdings. The exhibition uncovers the social, political and philosophical complexities told through the four-panel comic strip, which have inspired scores of artists in their own work. As a generation of artists who grew up during the ‘golden age’ of Peanuts come to prominence today, its presence in the ideas and ambitions of contemporary mediums, from film and fashion to street art and sculpture, seems more powerful and meaningful than ever before. Fiona Banner invokes Snoopy the Flying Ace as a powerful commentary on the bitter futility of war, while Steve Claydon looks to Pig Pen’s cloud of dirt and flies to provide a metaphor for the cultural associations that amass around objects. Ryan Gander unpicks the constituent elements of Linus’s psyche to lay bare the strength of his vulnerabilities, and Andy Holden asks for Charlie Brown’s help to propose a new theory on how art operates after the end of art.